Ray Lewis getting arrested at Occupy Wall Street. On Monday night, a student protest at Baruch College, part of the City University of New York (CUNY), began as a peaceful march and demonstration against tuition hikes. But it quickly escalated into a situation where police were pushing students and faculty out of a public forum of CUNY’s Board of Trustees. The incident was terrifying for many of us present, though it fortunately did not result in any serious injuries. 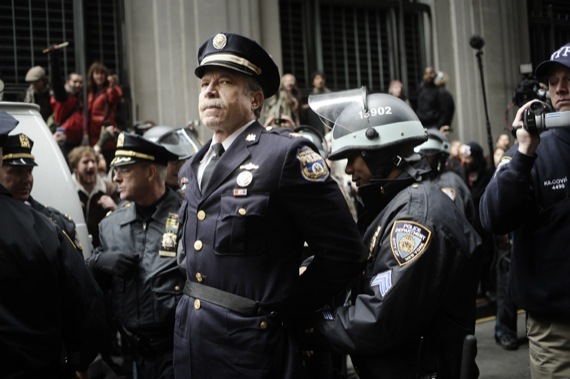 The greater damage, perhaps, was emblematic of a pervasive problem in the Occupy movement: the police became a proxy for the “one percent,” and instead of protesters finding ways to directly challenge the powerful elite, they ended up taking their anger out on police officers. As the protesters pushed their way into the lobby of Baruch, security guards tried to usher them into an overflow room where they could watch it televised, but that wouldn’t suffice. People huddled in the lobby, trying to decide what to do: hold a general assembly to voice grievances about rising tuition, or go into the overflow room. But some people couldn’t give up on the idea of entering the Trustees meeting. They waved their IDs desperately at the security guards, saying, “I’m a student here! Why can’t I go in if the meeting is public?” Soon, a line of police officers formed in front of the protesters. The cops held their batons horizontally in front of their chests. A security official tried to issue orders to the protesters over a loudspeaker, saying that they would have to leave or there would be consequences, but he was hardly audible. Then, the cops began moving forward, their batons pushing into the protesters’ torsos. The room exploded. Protesters pushed back against the cops, attempting to get around them. In response, the cops shoved harder against the protesters with their batons. This went on for about 30 minutes until every protester had been physically pushed out of the building. Some arrests were made. From what I could tell from my vantage point, standing on a table, not a single baton was used to beat protesters. An elephant in the room, perhaps, was the recent incident at UC Davis. The use of pepper spray on student protesters there on November 17 has prompted conversations about police violence around the world. On Sunday night, I attended a discussion of the Occupy Wall Street People’s Think Tank on the topic of “Policing and the Movement.” We were surprised to be joined by an authority on the subject: former Philadelphia police captain Ray Lewis. Lewis came to New York City after seeing on the news how the NYPD was treating Occupy Wall Street protesters. He arrived right after the eviction occurred; a few days later, on November 17, he found himself standing alongside protesters who were trying to shut down the New York Stock Exchange. He refused to budge from the entrance to the NYSE, and was arrested. In uniform. Sitting on a piece of cardboard at the Think Tank, Lewis shared some insights into the life of a police officer. He also listened intently to what others had to say. It was his first time using consensus procedures, but he quickly adapted to the hand signals. One of the things that Lewis finds seriously problematic is white-shirt NYPD officers getting involved in altercations. The white-shirts, he explained, have a supervisorial role over the blue shirts; when they become involved rather than standing aside, there is no one monitoring and issuing orders. That’s a situation in which things can get out of hand, Lewis explained. “The police are only supposed to use force to prevent bodily injury or death. The idea is to use the minimum force necessary to accomplish the task,” he said. At Baruch, the protesters were belligerently demanding something they could not be granted, and the police were, in fact, using the minimum force necessary to accomplish the task of getting them outside the building. What happened in the Baruch lobby was unsettling—for the protesters, who had no idea whether the police would suddenly turn violent, for the police themselves, who seemed unprepared to deal with the students’ aggressiveness, and for security officers, who had no control over the police once the confrontation began. I couldn’t help but imagine that this anxiety will stay with these protesters the next time they march, making them feel angrier at the cops, and that it will stay with the police next time they monitor a protest, making them feel less sympathetic toward activists. But the conflict between the protesters and the police was entirely unrelated to the issue of tuition hikes. The Occupy movement has at times been strengthened by the police violence used against it, but the police are also turning into a dangerous distraction from the movement’s real aims. I really appreciate this first-hand account and the questions it poses. How do I join this thinktank? The Occupy movements have such deep common origins, we should try to articulate them. The object is to let the occupiers see that they really are fighting a war that could precede one of the largest non-violent (mostly) revolutions of at least modern history. Please e-mail me with how/where I can do this? I’m now retired, have a PhD. in theology, 23 years as a liberal (Unitarian) minister, and history of taking on very controversial topics in sermons and writings — like the November 2004 sermon “Living Under Fascism,” which went fairly global and moved the owner of Chelsea Green publishing to ask me to do a book on social/political critiques (AMERICA, FASCISM & GOD: SERMONS FROM A HERETICAL PREACHER”). Hi Davidson, you can join the Think Tank by going to nycga.net and getting on the Think Tank mailing list, or emailing OWSThinkTank at gmail.com.